A lot of people claim that they have sensitive skin when they break out after using a certain product or were exposed to the sun. However, most of than not, the culprits behind the blotchy skin and zits are using inappropriate products for one's skin type and bad skin habits. Skin cancer can all be a cause of skin sensitivity, visit My Skin Centre to get a check up. If you are one of the many who break out or itch after sun exposure or using a product, it is a good idea to determine if sensitive skin is really the cause or something else. How to tell if you have sensitive skin? Generally, sensitive skin is thin with visible broken capillaries under the skin's surface. Sensitive skin also has fine pores. When exposed to moderate changes in temperature, sensitive skin reddens easily, whether from cold or heat. Sensitive skin tends to rash easily when exposed to dirt or even moderate strength skin care products. If your skin manifests these signs, chances are high that you really have sensitive skin. For a thorough skin assessment, a visit to a dermatologist is in order. Since caring for sensitive skin can be quite difficult, it is advisable to limit the use of skin care products. Generally, simple skin care regimens are more effective on skin since it prevents product overload. Sensitive skin care relies on strengthening the skin to reduce sensitivity and increase tolerance. Sensitive skin is prone to dryness which can lead to increased sensitivity. Drinking eight or more glasses of water and applying a lightweight and hypoallergenic moisturizer a day can help restore your skin's moisture or lipid barrier that acts as defense mechanism against allergens. Fruits, vegetables, and other water-rich foods are essential in correcting skin imbalances. The vitamin, mineral, and water content of these foods hydrate your skin and restore its health. On the other hand, eating spicy food and drinking alcohol and caffeinated drinks can increase your skin's sensitivity. Sun exposure can cause sensitive skin to redden and burn easily. Before going out, apply sun protection on your face using sunscreen and on your body with sunblock lotion. You can extend the protection to your lips to prevent them from darkening. Applying an SPF-rich lip balm under your lipstick or gloss can help protect your lips. Umbrellas, sunglasses, and hats protect your body, eyes, and face from overexposure to the sun. Protect skin at all times. Even when you are indoors, your skin still needs protection. If you are staying in an airconditioned room or one with forced heating, apply a lightweight moisturizer frequently. this will prevent your skin from drying out due to the extreme temperatures. Avoid products with artificial colorants and synthetic fragrances. Colorants and fragrances are added to skin care products only for increasing marketing appeal. Your skin do not actually benefit from these additions. Often, they even cause allergic reactions and increase your skin's sensitivity. Aside from these tips, it is also a good idea to switch to skin care products that are specially formulated for sensitive skin. 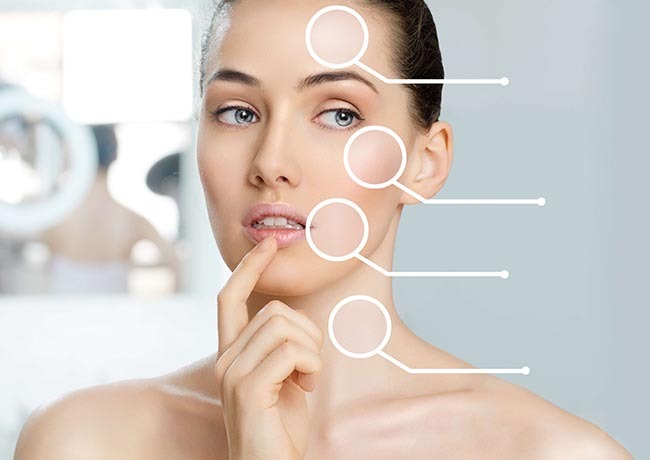 A thorough skin assessment and consultation with a dermatologist can reveal to you skin care techniques and products that can help strengthen your skin and minimize its sensitivity.